Kathy Perret is an education consultant for Northwest Area Education Agency in Sioux City, Iowa, focusing on the areas of teacher leadership, literacy, and English as a second language, and an adjunct professor at Morningside College in Sioux City. She has also been an instructional coach at the elementary and middle school levels and currently serves as an educational enhancer for her private consulting business, Keep Your Passion, where she provides learning opportunities in the area of instructional coaching. Prior to her consulting and coaching work, Perret spent 18 years as an elementary teacher in Iowa, serving students at St. Rose of Lima in Denison, Woodbury Central Community School District in Moville, and Sioux City Community Schools. Staying connected with her former students via social media and seeing their contributions to the world fill her with pride. She earned her Bachelor of Science degree in elementary education at Iowa State University in Ames, Iowa; her master's degree at Morningside College in Sioux City, Iowa; and her Iowa PK–12 Administrative Endorsement through the Iowa Principal Leadership Program in Storm Lake, Iowa. She also holds endorsements in the area of K–8 Reading and K–12 ESL. Perret enjoys spending her spare time as a community and state volunteer. She is currently the board secretary for the Mary Elizabeth Child Care Center and a volunteer with the Canine Assisted Therapy Program for STARS, Inc., both in Sioux City, Iowa. She is the former president of several organizations, including Leadership Siouxland, the Siouxland Reading Association, and Learning Forward Iowa. She is the proud aunt to three nephews and one niece and the guardian to a rescued Schnoodle named Boji. After much training and coaching, Boji became a certified therapy dog, and together Perret and Boji bring joy to others through the K9 STARS Read-to-Me Program. 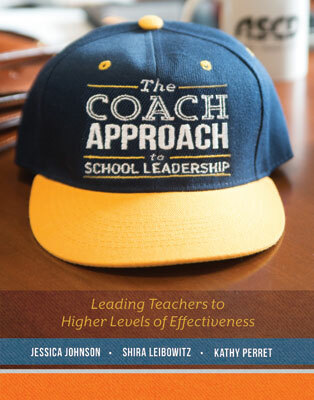 Three coaching and leadership experts explore how using instructional coaching techniques enables principals to balance learning leadership with their evaluative and supervisory duties.